Tag Archive | "bmm alumni"
University Description: Leicester is a leading university, ranked 12th by the Guardian University Guide and 15th and top in the region by the Times Good University Guide. The programmes are firmly rooted in a strong research culture. There are opportunities to participate in specialist courses and multi-disciplinary research. Course Description: Full Time – The course aims to provide a thorough grounding in the theories, approaches and research necessary for studying, analysing, and understanding media and communication processes in both national and global contexts. The course enables the students to critically engage with contemporary debates on social, political and cultural roles and communication in modern societies. Distance Learning – The course aims to equip students for research and analysis of media production, texts and audiences in global context. The course integrates critical theory with issues of policy and professional practice for students who work in any of the various sectors of the communications industries and professions, or who aspire to do so, or who are involved in media education and training. Eligibility Criteria: A good second class honours degree in any discipline, though a social science degree would be particularly relevant, from an institution recognised by the university. Applicants who do not have a first degree, but who can demonstrate other relevant qualifications and/or experience may also be considered. Course Description: In a dynamic and rapidly expanding industry the MSc International Events management represents an educational innovation dedicated to producing skilled and knowledgeable events practitioners capable not only of delivering exceptional events experiences, but also understanding the cultural phenomenon, policy frameworks and international practices that inform and challenge today’s events. IELTS test score of 6.0 with no element less than 5.5. Applicants are likely to hold a UK Honours degree 2:2 or equivalent in a cognate area. Similarly, candidates with significant professional experience in the events sector but a less academic background will be considered. Organization Description: A transnational information and publishing house with a database and research base spanning projects across all industries in India and a special focus on information in construction, real estate and infrastructure. Its publishing activities span publications in seven countries and have partnered leading events both in India & International. It has five offices in India and one overseas. Compensation/Stipend: For Trainee Rs. 8,000/- to 10,000/- and for other it would be best in the industry. Selection Process: Writing & editing test and subsequently followed by a personal interview with product head. Sales of high quality research Reports and Newsletters on India’s energy and infrastructure sectors. Candidate should have experience of at least 3 years in similar area of businesses. He/she should be dynamic result-oriented professional with articulation skills and must have excellent command over English. He/she should also have capability to understand the content of research reports to help market them. Understanding of the sectors will be preferable. K.P.B. 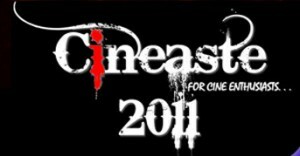 Hinduja College Of Commerce presents Cineaste’11, the annual BMM festival! This year the fest revolves around the theme ‘Bollywood!’ All the events involve a bollywood twist. Rock band, Drama, Street dance, Fashion show, Documentaries, Short films, Ad creation, Journalism, Acapella singing, Airbanding, Spoof videos…phew! You name it and it is a part of this grand cinematic extravaganza. You Currently Work At ISMT Ltd. – Branding & Communications – Asst. V.P. 1. For ISMT Ltd: All brand building activities, corporate films, Project Management for participation in several exhibitions worldwide. Most challenging project/campaign you’ve been part of? What made it challenging? Project Management for Power-Gen Europe (an exhibition held in Cologne, Germany). It was my first major international assignment and I had to work with a team that had people from different background (Stand building, Graphic design, Printing, Logistics, Hospitality, Production, Marketing, Finance etc. ), stationed at different countries. Managing a gamut of activities with people across different time zones was challenging. How did you start your career? What was your first step after completing BMM? I was clueless what I wanted to do with my life till the 3rd year of BMM. One short film (that I made for Frames Film Festival 2006) changed all that. I knew I had to make films. So the first thing I did after BMM was to join a Production House and started assisting a TV producer/director. Were you clear about which field you wanted to get into right from the beginning? What helped you take your leaps? I joined BMM after 4 medical entrance exams, 3.5 months of engineering and 7 days of BSC. That should say a lot about how confused I was. Back then … Med, Engg, Archi, were the only “sensible” things to do for science grad. Regular projects, change in subjects every semester, Films and more films, college festivals, doing odd internships in summer breaks helped me take leaps. I didn’t have a plan. I know my moment of clarity came when I made my first short film. But I can only connect the dots in retrospect. Any particular incident that helped you discover your career option? The short film and the entire BMM experience helped me understand what I wanted to do. But my professional experience in the film and TV industry helped me understand about my career options. Yes .. I think for career based on liberal arts and sciences … it helps. I think it might also help one to discover oneself for the course is diverse and gives you a feel of everything. Do the subjects in BMM help you know the reality of the job? Is there any place for theory in the industry you’re in? Subjects give you a birds eye view. It will tell you where the pool is, show you the water, tell you stories about people who’ve been good or bad swimmers, suggest necessary equipment and may even give you some simulated survival tactics. Yes it does. In addition to the “brand” of the institution itself, the quality of faculty, guest lecturers, industry interaction etc matter. Did you complete any internship(s) – where, when, how was the experience? In Boch&Ferns as a copywriter. Internships during BMM – are they relevant in the long run? Relevant for the short run. Important if you are seeking clarity. I would recommend an internship in every break. Work Ex or Higher Studies? What’s your pick? Why? Work Ex first .. Higher studies later. (and not the other way around). BMM is What you make of it. Your biggest achievement till date None to really brag about. You regret None so far. Define your job in one sentence Making the Organization look good. Your favorite professor at college I’ll let this pass. From my own experience I’ll tell you it’s very difficult to find a Broadcast Media-TV internship in India Broadcast Networks unless one has good contacts. Do share your tips to BMMiites? Every week, we feature the journey of a BMM Alumni, who’s been there and done that. Watch out, as these people share their real life experiences with BMMBox, only for you to realize your own career path. We will try to feature alumni from various fields like Journalism, Copywriting, Production, Advertising, PR and Event Management. You can ask questions, get your doubts cleared or simply thank them for sharing their thoughts with us :-).